Practicing on the Driving Range is much like Practicing on any of the courses. In addition to the standard Menu items covered in the How To Use OptiShot section, the Driving Range has one new item: New Target. This behaves the same as New Hole on the courses. Open the Location menu in the upper right and click on New Target. This submenu allows you to move to a different target flag. You can also select a target flag using the new Target toolbar described below. One other difference is the the Always Follow option is not available on the Driving Range. The Overhead map has three configurations. Closed in which the map and toolbar are hidden. You can switch between these views using the Tab control at the edge of the display or by using the O key on your keyboard. With only the Target Toolbar visible. With the Overhead Map completely hidden. 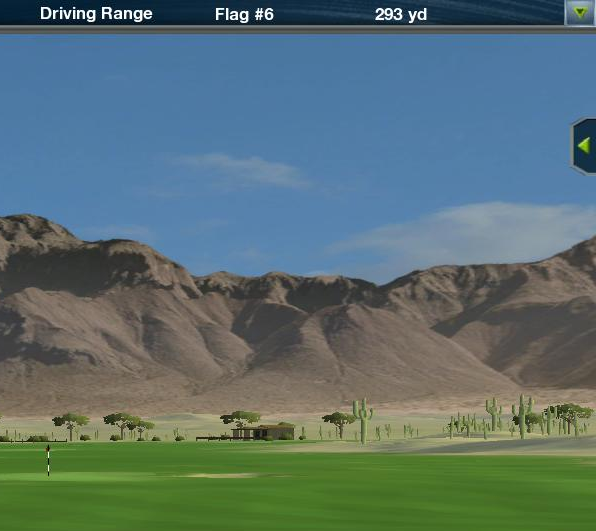 As in Practice on the courses, you can click on the Overhead Map to place the ball. 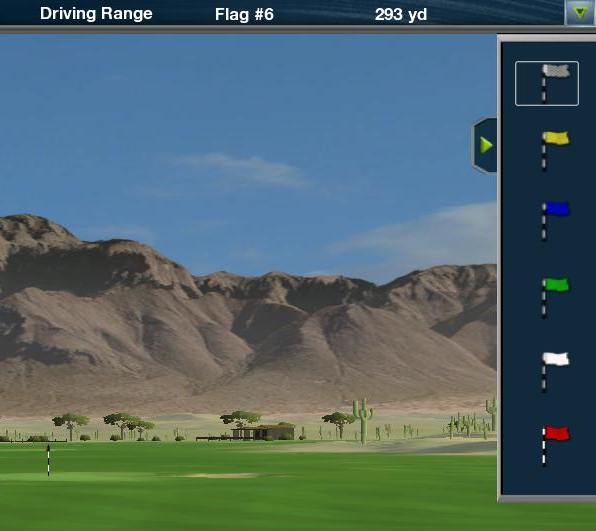 Change the map to display from your ball to the flag, or show the entire range from the tee to the flag. Show the balls for all shots, or only the last shot taken. Show tracers for all shots, or only the last shot taken. Show or hide the distance grid. 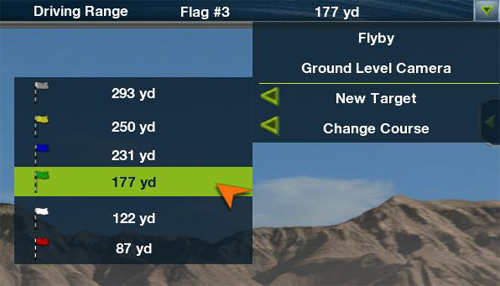 When you select a target flag, OptiShot will display either Target Flag Rings around the flag or Driving Accuracy Lines from the tee to the target. 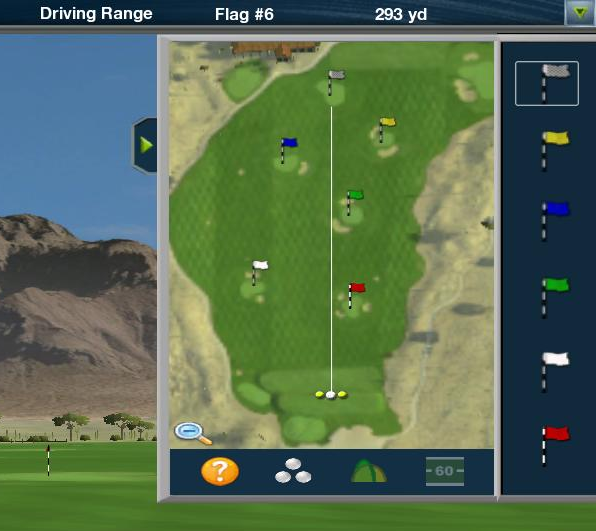 These will allow you to visually see the precision of your shots and track your accuracy. Use these to practice accuracy in hitting a particular target. There are four zones at increasing distances from the flag. These are used to determine how far off center line your drives are. To help improve your accuracy, one way you can practice is by displaying the accuracy lines. Another new display is the Pinpoint Precision Data display on the left side of the screen. For each target flag ring or driving accuracy line we show the number of shots taken and the percentage of shots that landed within that zone. On the right are icons for changing from Target Flag Rings to Driving Accuracy Lines as well as the icon for the target flag you are currently shooting towards. The X icon will clear the current data allowing you begin new session. If you wish to simply use the driving range without the Rings or Lines, click the tab at the right of the Pinpoint Precision Display. It will slide off screen and hide the Rings and Lines.